Gutters are an integral part of any roofing system. They assist the roof with proper runoff, enabling rainfall to flow steadily from the rooftop, away from doors and windows, and directs the water away from the building’s foundation. But, as most homeowners are aware, gutter systems have one major flaw: clogging. The worst part of standard gutter systems is the inevitable accumulation of leaves, twigs, and dirt that clog the gutters and inhibit proper water runoff. 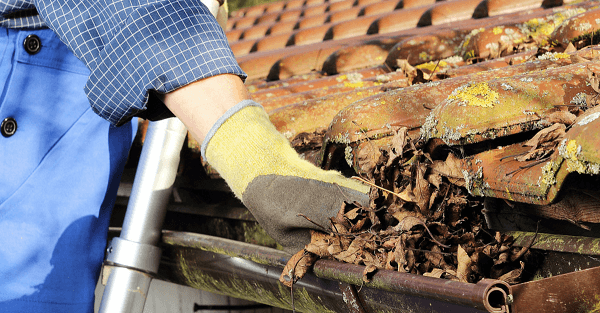 Let’s face it: cleaning gutters is a dirty and somewhat dangerous project. Insects and filth sit and soak for hours (days, weeks, etc.) at the edge of a home, decaying and forcing backups and dripping. Fortunately, they make gutter guards: a cap for gutters that filters out unwanted debris, enabling your gutters to function properly throughout the year in Placerville and the Sacramento Valley. Thanks to gutter guards, homeowners now have the freedom to remain safely on the ground, without having to risk climbing a ladder to scrape out insects and leaves that clog the gutter system. Gutter guards are not a mandatory component to your roofing system (although we think they should be! ), but they are an easy, affordable means making your life a little easier. If you’re considering upgrading or replacing your gutters, take a close look at modern gutter protection systems. You’ll be glad you did, especially if you dread cleaning gutters! Contact Straight Line Construction for help with the exteriors of your Placerville home!